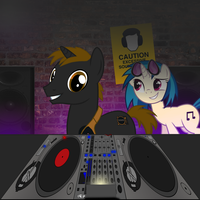 I present Miss DJ Vinyl Scratch! She sure is one cute pony...! I used the color guide [link] graciously provided by -- Really fantastic color work on his part! MLP:FiM is copyright Hasbro and Lauren Faust. 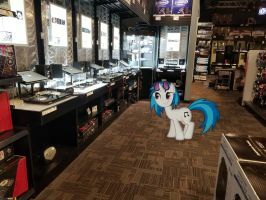 some folks complain when vinyl is seen with magenta eyes...well, i have a headcanon for that (based upon a vinyl/octavia tumblr dub i seen on youtube once) basically, her true eye color is red but she sometimes wears contact lenses that make them appear to be magenta. thoughts? hehe, i love that smile! Much appreciated! By all means you're more than welcome to help yourself ^.^ You OC is very cute and I do like her color scheme, good stuff! Awesome vector! I used it here. Freaking awesome! Was wondering if I could use as profile pic? awesome! i used it to make my icon! This is free to be used, right? Just checking. Yes it is. Please help yourself! That's a nice face to go by. Although the red eyes would have been preferred. Care for a separate red eye version? Ooo, a lot more shiny and stand out. I'll do one up. Suggestions welcome on style if you have specific preferences. !